The Ireland women's bobsleigh team have finished a creditable 17th of the 21 teams who took part at the Winter Olympic games in Vancouver. 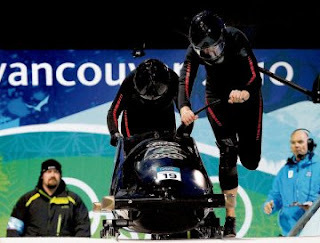 Aoife Hoey and Claire Bergin moved upthe rankings on their thrid and fourth runs at the lightning fast Whistler track. They completed thier series with a time of 54.58 for their final run, picking up time on the final few bends. Their run times were 55.4, 54.49, 54.73 and 54.58 (total time 3:38.85 - 6.56 secs down on the winners) and they attained speeds of up to 142.4kph. They also managed conistent good start times of 5.44. Behind them came Russia and Australia - the team that had tried to have the Irish bob knocked out of the competition. Crashing out were GB 1 and Ger2. Canada won the gold with a total time of 3:32.28. The pair had survived two legal bids to have them removed from the competition in favour of teams from Australia and Brazil in a geographical dispute. “We’re thrilled to finish 17th and will hold our heads up high in the knowledge we did our best for our country on what was the fastest and toughest track we have ever encountered,” said Hoey. “The atmosphere at the track was awesome. We decided to go for broke on each run but being careful not to crash. After all the legal fuss before the competition, we feel vindicated with the results achieved here,” she added. The Australians were eliminated after the third heat. “I’m so happy we got to do the fourth run. The support we had here is fantastic, " said Bergin.